MORLEY councillors have put up a £500 reward for information leading to the conviction of anyone found to be responsible for the blaze which all but destroyed St Mary's in the Wood Church. It is still unclear how Saturday morning's fire began but on Morley Borough Independent councillors have said if proven to be arson they will put up the reward, donated by them from their allowances. Coun Terry Grayshon, who was at the scene while firefighters fought the inferno, called the fire "an attack on Morley's heritage and an offence against all Morley residents". After surveying the damage after the fire was finally put out he said: "We are hoping that the shell of the building is structurally sound and we will be working with the developer to do what we can to preserve this historical building. "We need to adopt a progressive approach to make sure something positive comes out of this tragedy". Structural engineers are to undertake further survey work later in the week and councillors are hoping to receive some new ideas for developing the site in the near future. A joint West Yorkshire Police and Fire Service investigation is still to uncover the cause of the fire, which ripped through the building just after 2am on Saturday. By the time fire crews from Morley, Leeds Batley, Cleckheaton ad surrounding stations attended the blaze at around 2.30am the church was already consumed in an inferno. Around 20 people living in neighbouring flats were evacuated to Morrisons supermarket amid initial fears the church steeple might collapse. Police say the fire has caused "serious and significant" damage to the church and work is now being carried out to establish whether or not any of the building can be saved. The congregation of St Mary's moved out of the church in 2008 after it became financially unviable for them to stay there. They moved just yards away into the church hall in Commercial Street. The church building was then sold to Gibralter-based developer Graham Butterworth who had ambitions to develop the site into a luxury hotel and restaurant. The plan was controversial and attracted a high-profile campaign against it. However, it is no longer clear if the development, which it is believed was set to be given permission by Leeds City Council next month, will now be possible. "It is possible we will have to go back to the drawing board," Mr Butterworth said this week, adding his company would now look at whether it was "financially viable" to carry on with plans. The members and elders of St Mary's in the Wood issued a statement saying they were "devastated that their beautiful former building has been destroyed." It adds: "The nonconformist history reaches back 360 years. Throughout those years many who worshipped there were committed to the church and to Morley. This being so the heritage and the worship are interwoven. "The church building has gone but memories do not fade." Church members put on a brave face as they went ahead with their planned community open day in the church hall on Saturday. Morley councillor and church secretary Shirley Varley was close to tears as she spoke at the event. 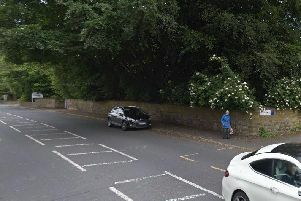 "In recent times, to many people, St Mary's in the Wood was a landmark on the skyline of Morley, and only had the significance of the heritage it held in the history of the town," she said. "To the church members, the congregation and friends of St Mary's, it was much more. "The fellowship of St Mary's was based on simple Christian values based upon family, community, faith and the love of Jesus. Many of Morley's benefactors were remembered in the church. Those men and women were committed to their church and to their town, the two were entwined. All that has been destroyed!" The church's beautiful stained glass windows, many of which acted as memorials to prominent Morleans, had been boarded up since it closed to protect them from vandalism. All have now been completely destroyed. The current church was built in 1878 but a place of worship has stood on the site for almost 1,000 years at least, the original being mentioned in the Domesday Book. St Mary's is a Grade II listed building and its tower hoses the famous Pancake Bell which it is believed originally came from Kirkstall Abbey. Hopes remain the bell can be salvaged. The congregation of St Mary's will be compiling a book entitled Memories of St Mary's in the Wood. If anyone has any memories they wish to be included in his book they can go along to the church hall on Saturday from 10am-noon. The church Elders will also be meeting this week to discuss arrangements for a memorial service in the autumn.